Surface studied by Henri Cartan and Hassler Whitney in 1957. Henri Cartan (1904 - 2008): French mathematician. Cartan's umbrella is the algebraic surface with the above equation, with the characteristic of having an isolated line (the axis Oz), the handle of the umbrella (cf also Whitney's umbrella). 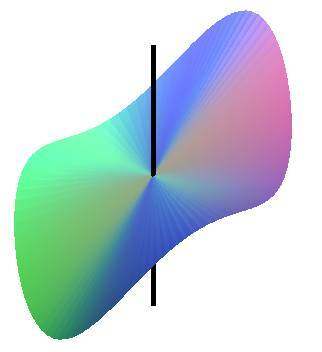 Cartan's umbrella can be defined as a cone with directrix a cubic of Agnesi.